Yesterday was All Hallows’ Eve, and it was also my birthday. My grandma died a few days before my 21st birthday. 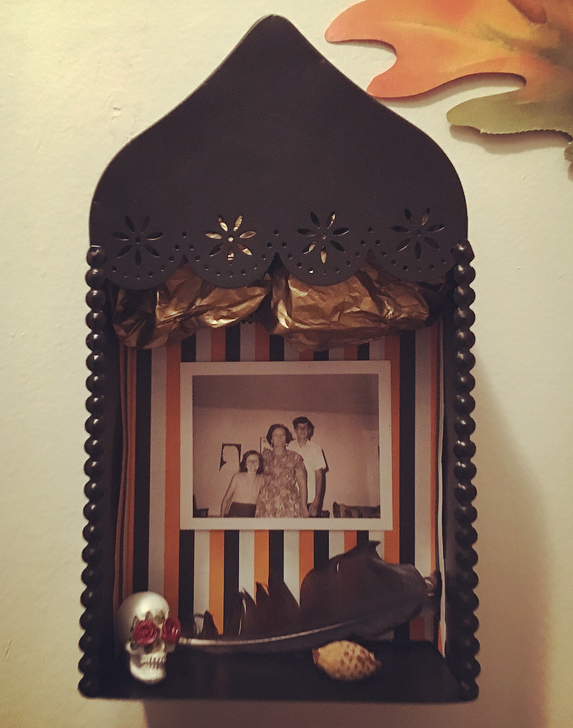 I chose to remember her last night by creating a tiny ancestor shrine. For me, building my own memorial is a more personal and powerful way to remember the dead than any mausoleum. I visit this sacred object as frequently as I wish, I can modify it any time, and I don’t have to travel to an impersonal headstone to conduct rituals of remembrance (although I have done so many times). I’ve used the same photo as in my recent post about the story of her death although I have many others to choose from. 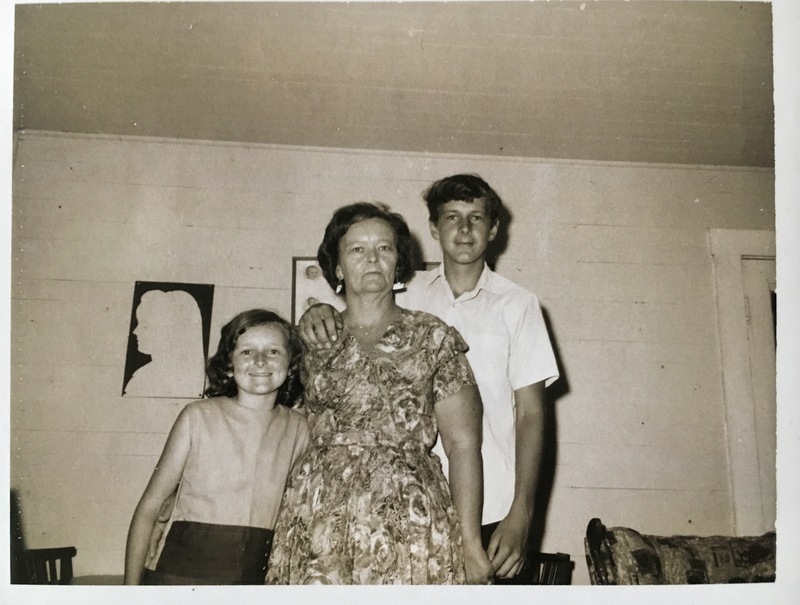 Her children stand beside her: my mother, who is thankfully still living, and her brother David Sr., who passed away some years ago after a painful struggle against lung cancer. Memorials like this are observed in many traditions, including the pagan tradition I follow in conjunction with Quaker practice. I honor those traditions today with gratitude. Blessed be the beloved dead. Fictional storytelling has been a part of my life for as long as I can remember. I wrote my first fan fiction in the 5th grade. I crave story, I think about it almost constantly. I surround myself with other writers and creatives to whom stories are more than a passing interest or hobby. But lately, personal narrative is of increasing importance to me, too. Collectively, I think we need stories for these tough times, and we need them to help us imagine a better future. Personally, I need them for recovery from grief. I’ve carried this scrawled message to myself for the past seven years. I wasn’t surprised to find evidence from the fields of mental health, educational psychology and even cardiac treatment that all suggest telling stories AND being heard is integral to healing. Mental health treatment points to a specific reason. Once experienced, trauma lives on in not just the mind but also the body, and the resulting anxiety, dissociation, and other stress reactions have lasting consequences for well-being. The brain struggles to make sense of events or block them out, but the trauma doesn’t really leave us until we’re able to reconstruct and reframe dissonance to reach understanding. We can reclaim our sense of self and safety through speaking. This is especially true when the dominant narrative is in conflict with our lived experience, as this study seems to indicate (at least, to me, without the authors actually positing). Listening to and telling stories that resonate with our own lives is healing. So, I’d like to tell a story about grief. I’m going to do so without thinking too hard about word craft, as though I’m speaking to you over a cup of tea. This is my maternal grandmother, Inez. When she died, I was twenty. She wasn’t a conventionally beautiful woman. She was overweight and uncouth and messy. She laughed loudly and often. Inez with my mother and uncle, 1968. I was born just five years later. All memory is flawed but this is what I remember. She died when I was two months into my junior year in college. I’d just transferred from a community college to a university and settled into a dorm room full of misfits two hours away from home. The distance seemed a world away, my first experience on my own and without a car. I was the first person in my immediate family to go away to college like this, so I had no generational wisdom to draw from. Here, dear reader, is when something somewhat unusual occurred. This occurrence made the normal process of grief quite difficult. My breath caught, and I asked him as calmly as I could which grandmother he was referring to. I had the good fortune to have three living grandmothers, my maternal grandmother, my paternal grandmother, and my paternal great-grandmother. Grandma Inez was the cheerfully stubborn Southern matriarch who gathered the extended families of her two sisters together on holidays and cooked huge pots of comfort food. She was warm, silly and affectionate. She was relatively young, as my mother had been a teen mom. She was the one who squeezed me in her sweaty arms and told me she was proud of me. My other grandmothers were more reserved and less affectionate, more silently judgmental, or so it seemed. To further complicate matters, there was also a fourth woman I called Grandma, a step-grandmother, if you will, who had married into our family. Incredibly, Jeff didn’t know which grandmother had died. My parents had asked him to convey the news to me, hoping his presence would soften the blow. He was also there to drive me back for the funeral. Sweet and helpful, but short on information. I can’t quite describe the feeling of grappling with this incomplete message. I couldn’t even cry, not knowing for whom I grieved. I felt almost as though I could keep the fact of death from being true by holding this incompleteness in my mind. Like the unthinkable hadn’t really happened. I might be attending the funeral of one grandmother in a few days, or it could be totally different person’s, with another kind of sorrow to feel. Who knew? In this time just before the popularization of cell phones, my parents could not be reached. I felt bewildered, with the grief that should have been flowing through me arrested in my chest, like a physical sensation of choking. In the blur of days that followed, I can’t remember when or how I learned the rest of the story. Of course, it was Grandma Inez. She’d suffered sudden heart failure while watching television in my parents’ living room. She fell from the recliner she’d been sitting in, and as she fell, pulled the chair sharply across the hardwood floor, leaving a gouge in the polished wood that continues to serve as reminder of those moments when my father frantically performed CPR. At the funeral and family gatherings, I found myself in the role of the Good Daughter, the College Girl, which was completely foreign to me. I was also something of an oddity as the family weirdo who wanted to be a writer. I dressed for the funeral in an old skirt-suit of my mother’s, probably handed down to her by her cousin who works in real estate. No one else in our lower-income family owned much in the way of funeral-appropriate clothing. My own cousin David, a lanky young man only a few years older than myself, came late to the funeral directly from his manual-labor job, wearing a dirtied uniform. I remember being angry on his behalf when more distant relatives whispered remarks about his lack of respect, and I hugged him fiercely. I positioned myself as the buffer between my introverted mother and the rest of the mourners. I could see the tremendous toll the rituals of death were taking on her; she was responsible for holding the space for the family. So, instead of grieving, I worked to protect her. I tried to hold the space for her. My own grief was still tightly coiled inside, unreleased. I have a murky, half-submerged memory of the graveside service, and of clinging to the casket handles, refusing to let go, until my father took my hands and led me away. When I returned to school, the numbness of those few days at home seemed to harden, compress and solidify. I felt cold and hard. My boyfriend Jeff ended our two-and-a-half year relationship for someone he’d met in our hometown. I then suffered a health crisis and then fell into a deep depression. I earned a D in a course I loved, a class on creative nonfiction. I couldn’t write, much less write about my own life. I was numb. Later, I returned home to help my mother clear the belongings from my grandmother’s home. 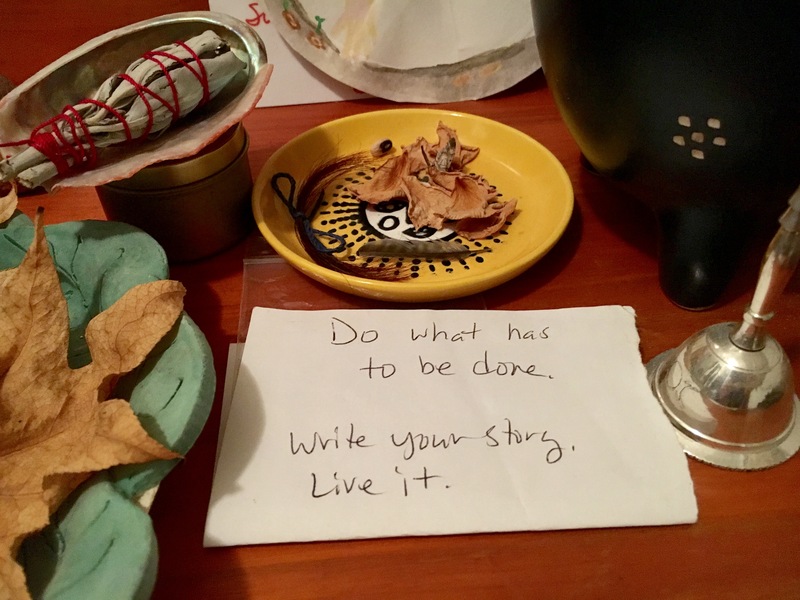 The process of packing and sorting the dishes and linens, which I think my mother found hard but healing, seemed surreal, as though my grandmother would return any moment, and the silence was too bright and loud. Time crept, its passage taking on a thicker quality. An image I’ll never forget: I opened a drawer in the sewing room only to encounter the slow sleepy eyes of a baby possum, whose slumber I’d disturbed in the long-empty house. Nature has a way of reclaiming and moving on, even when we cannot. The circumstances of not-knowing and serving as protector meant the grieving of my grandmother’s death was deferred for me, but the cognitive need remained. Windows into grief flickered open unexpectedly. I’d be reminded of her by a word or phrase, by something as simple as the sight of a breakfast cereal in a grocery store (she’d treated me and my sister with sweet cereals my mother could not afford to buy), and I’d feel a sudden sharp, bewildering sensation of her absence. I wondered if there was something wrong with me, if I couldn’t properly accept the loss, coupled loosely as it was with the betrayal and abandonment I felt when my relationship with Jeff crumbled. A few years later, something changed. I attended my first yoga class, and at the end of the session, I found myself drifting into a dreamlike state when the instructor took the group into Savasana, the Corpse Pose. In this resting state, I saw behind my closed eyes my grandmother’s face turning toward mine. I was badly shaken, and I certainly didn’t want to return to yoga the following week. But I did, and the same thing happened. I couldn’t avoid her face by keeping my eyes open, even though I tried. I told the kindly instructor, Jen, what had happened. She advised me to see the unwanted “visitation” as a gift. For weeks afterward, I opened myself to that interpretation, and to my surprise, I wept each time we entered Savasana. Not sobbing, just quiet streaming of tears and a silent vision of my grandmother’s face. The relief this gradually brought on is difficult to describe. I was able to both release the knot in my chest and obtain a sense of conclusion. Her face seemed to say that it was alright to let go of her. After this release, I found I could write again. I’m grateful for the healthy capacity of the mind to heal itself. Recounting this story here reminds me of my own potential for resilience. Relationships end. The world seems terribly unjust and even absurd. Denial of closure or justice welds pain in place, makes healing even harder. But I’m still here, and I have stories to tell, some painful truths and perfect moments of joy. Each of us have such stories, and many others besides. I could make a plug here for self-care, but I’m not saying yoga changed my life. I saying that telling our stories is truly essential to healing. I’m also grateful to have recently discovered podcasts like The Moth Radio Hour where people share their lives. I highly recommend it. If you have a story about grief you’d like to share, I invite you to do so in the comments. 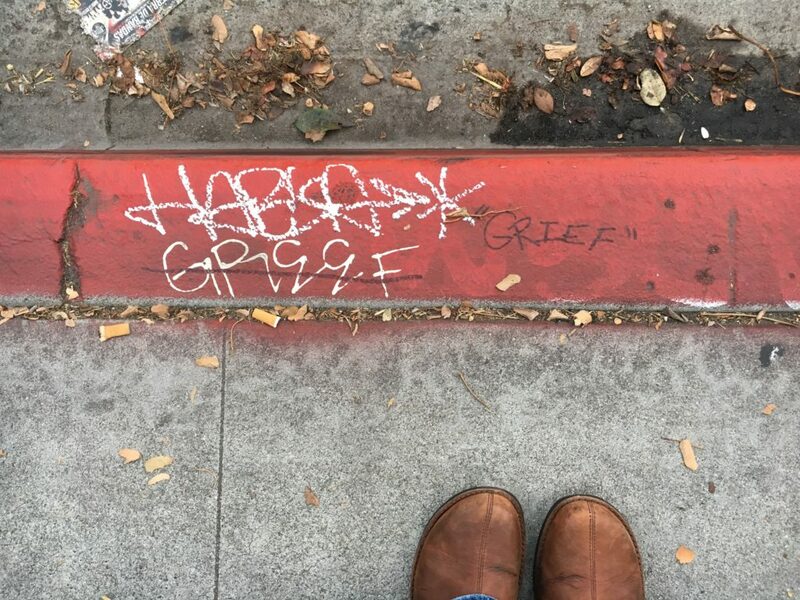 Neighborhood turf tagging positions the word “grief” along the path of my morning walks. Grief is complex: a cognitive jolt after the sudden realization of loss, then incredulity, perhaps anger or denial, and the mind’s grappling with an ongoing wrongness in the world. Grief is a response to trauma, and moving through can be cathartic and exhausting. But when we do, we can reach some kind of closure, regain a sense of safety, and move forward. We may feel broken, but we mend. I’m writing this at the conclusion of what I thought was to be a lifelong partnership, and I feel like someone died. In a very real way, something formerly vital is certainly dead. This sense that I have grieving to do is growing, both heightened and hindered by recognition that the world is incredibly broken and violent right now. Just reading the news is traumatizing, and there is a distinct dissonance between the awfulness of it all and the belief I have in the basic goodness of humanity. There is desperate suffering in the world, and a great many people I care for feel aggrieved and helpless. Worse, some feel their personal struggles or victories are not worth talking about, or they are somehow ashamed to focus on themselves. I’m considering what happens to us when closure, justice and healing are difficult to come by, and what I think can be done about it, for myself. But I’d like to share because tools are needed for sorrows large and small, for healthy ways to live in a world gone wrong. We are not broken.